The challenge with content marketing is that it seems that everybody and their brother is doing it. So should you follow the herd, and if so, what is the best way to go about it? You might’ve even had some of the same questions rolling around in your head that we’ve had. Have others formulated a strategy that is a repeatable process we can plug into our business? How do we distinguish between “best practices” (that are just opinions) and content marketing strategies that are tried and true when it comes to actually generating leads and sales. With over 2 million blog posts published every day, how do we rise above the noise? Is the purpose of content to sell or educate or both? Can’t we pitch our product/service in our content? How do we spend our money wisely and strategically, knowing it will work instead of simply hoping we get it right? Should we focus on quality or quantity content? But there's a real danger that you'll waste a lot of time and maybe even harm your brand if you don't think about it strategically. If you don't understand why content marketing works and how you should go about it, your content will not resonate with your audience. 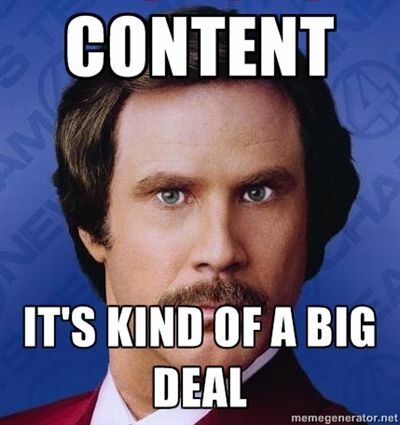 So why do content marketing at all? It’s getting harder to spur people to purchase directly from a digital ad due to ad blindness and ad blockers. Since this is a trending issue, content marketing is a better substitute for declining interest and effectiveness of paid ads. Get your brand in front of a new audience. Help potential customers see you are a genuine thought leader through your top-notch content. Engage visitors to give their email address to you in exchange for more invaluable content. Nurture them with more content through email marketing and occasionally ask for the sale as you earn their trust more and more. Imaginasium has tried different strategies time and again to get our content to stand out above the crowd; frankly, we’ve had some failures and wins. But we haven’t given up; this persistence to following a strategy is paying off for us. One thing is for sure; a solid content marketing strategy is required in order to get prospective customers to take action. We’ve all spent lots of time and/or money on marketing initiatives that, in retrospect, was mostly or wholly wasted. Want to Generate Visits and Qualified Leads Every Month? While there are many types of content marketing, there are important aspects to consider and plan your strategy in order to fully leverage your content marketing. Before we get too deep into the benefits of content marketing strategies that work, we should review a few items to avoid like the plague. It would be a mistake to use content to pitch a product or service directly since people who read/view our content usually aren’t ready to buy. They can draw the conclusion that you sell something as they read more of your content. Plus, if you hook them into subscribing to your email list by giving away an ebook, you can continue the conversation with content first, but you can sprinkle a pitch or two in your emails to them. Focus on educating the potential consumer, and over time, they will reward you. Give a lot of value away via longer-form content. Don’t skimp. Because there is so much competition, you must find a way to stand out in terms of quality and comprehensive information. If you have the resources, you should do both quality and quantity, but if you have to pick (as most of us do), choose to produce less quantity, but higher-quality content. Yet, it’s surprising how few organizations focus on quality. There is a palpable pressure to regularly pound out content, but is that really that effective? We recommend you create less content if that means you can take more time to create something robust and invaluable to your reader. Then spend extra time promoting the heck out of it. The problem with that is there are so many “best practices” offered by lots of “experts.” Some of them are true gurus; others are charlatans. Plus, what worked for someone else may not apply to your situation exactly. That’s why it’s better to look at case studies in your industry that have tangible stats and figures on their performance. This tends to winnow out strategies that won’t work for you or are just someone’s opinion. Then figure out how to modify them for your own company’s purposes. Use of the term “content marketing” has reached an almost “fever pitch.” Almost enough to make it a meaningless buzzword. That popularity alone has gotten most organizations believing they need to create content marketing at all costs. But why should we participate in this massively growing trend? And how will we get significant, tangible results? Are there real benefits to content marketing? While SEO has radically changed in the last 10-15 years and it is much harder to perform successfully than ever before, it is absolutely worth the extra effort. The key benefit to this is that you can gain new visits to your website from prospective customers month-after-month and year-after-year. The challenge is that you can’t just write content that you think readers are searching for, slap a few keywords on it, and expect results. Plus, creating more quantity of content is not going to drive search engine traffic like fewer, quality, strategically-keyword-researched content will. If you want to understand a tried-and-true strategy for gaining organic traffic on Google, reach out, and we would be happy to chat more about this complex formula for success. We even have client data and examples to prove our expertise. The term “thought leader” is tossed around so much as to devalue the true worth of it. But there are genuine leaders of topical information, right? It just takes a higher quality of information to set yourself apart from the volume of lower-quality content being generated daily. If you want to be viewed as an authentic thought leader, you must deliver quality over and over to earn your visitor’s trust long before you can ask them for the sale. By creating high-quality content, social media shares and others linking back to your articles generally rise. This increases your perceived social proof and authority that your website pages have in the eyes of visitors and Google. While in the short term, costs are generally higher for content marketing initiatives, they have a lower cost and higher ROI when viewed over the long term, especially when you create a content asset that truly drives traffic for many months and years to come. What better way to earn trust than to educate people on things they care about (related to your brand of course)? When done over time, you earn social currency a little bit at a time; once people feel more comfortable with you, they want to buy from you and tell all of their friends and colleagues how great you are. As you provide value to them, they want to be a valuable resource to others, thus they share your stuff. Content is all about giving away a ton of value to people who may never buy your product or service. So why should we give stuff away when there is no guarantee of a return? Because that is the way the digital world works. People are so tired of ads; they don’t want to be sold. But if you give them tons of value with no strings attached, they have a good chance at becoming lifelong, loyal customers. While we would all prefer to run an ad and convert those into paying customers right away, this is fast becoming a less and less effective method. People are tuning out advertising messages as indicated by the increased usage of ad blockers and ad blindness. If you want to move people through your sales funnel faster, we must first recognize that we have to start near the top. They aren’t truly cold leads since we are qualifying them by the topic of our content, but many simply aren’t ready to buy just yet. But don’t be discouraged; this is where content excels in warming them up to your product or service offering. Adding your content into an email series can ascend your potential customers to a higher level faster. Since we are targeting a specific topic for our content asset, people who are interested are naturally more qualified than not. So it’s key to select the right topics; not ones that are going to turn into sales today or this week but are months or years in the making. The focus with content shouldn’t be on converting right away, but identifying qualified leads you can build and nurture relationships with over time. Many of those relationships will turn into lifelong customers if you persistently invest in them. While there are lots of types of content we can invest our time and money in, we are going to focus on thirteen of the most popular content types … those that are most effective in reaching and engaging people. Beginning to supplant talk radio programs, podcasts are a solid way to build a following of fanatics that rabidly share positive things about your brand. It also allows you to talk directly to a niche audience, narrowing your message to a core tribe that is highly interested and engaged. On top of getting your content/thinking in front of potential customers, you can often offer advertisers a slot on your program for a fee. Alternatively, you can run ads for your company there as well since you have now created an “owned media” channel. Who doesn’t like a robust, visually-appealing representation of facts and figures on a topic? These tend to break up the monotony of content by delivering compelling stats in bite-sized chunks, easily digestible and shareable. Plus, they are great at garnering links to pages on your website, thus enhancing your SEO effectiveness. See an infographic on inspirational leaders​ that we put together for a client. This is the ultimate in multi-sensory content; you can do so much with this medium by evoking emotions with imagery, comedy, music, etc. While this can be done well, it can be equally boring and stale. Make sure to include some pizazz, but not just for its sake. It must resonate deeply with the viewer in order to retain their attention. An effective video starts with understanding the viewer first, what they care about, then connecting with them on some kind of emotional level—whether that's appealing to the heart like the Plexus video we created (below) or making them laugh. Or it could be something inspiring, challenging, enlightening, etc. Video is best when it makes you feel something, so make them feel something. While longform articles take significantly more investment and time to do well, the cost-per-lead-acquisition is less when viewing those costs over time rather than just as an upfront expense. If you are aiming to demonstrate your expertise in an area, case studies are a great way to go. These allow you to dive into the “how you did it” as well as the proof that it worked with stats and examples of your work. E-book creation has exploded in recent years; 2,764 books are self published each day in the US alone! But don’t forget to market them strategically so you aren’t lost in the growing sea of books. Here is an e-book example that we have on our website. White papers are similar to e-books, but they are typically longer and are “the academic papers” of marketing content. Readers expect a high degree of expertise backed by solid research that is fully documented by references. “List posts” or “listicles” are the #1 most popular types of content on the internet. Shared 2-10 times more often than other content types, these lists of “25 Things to Know About XYZ” engage people in ways other ones just can’t. If you are looking for the perfect type of content to start your content journey with, look no further. Here is an example of a checklist we created with “15 Tips and Steps to Better Sales and Marketing Alignment”. We love gifs, don’t we? GIF viewers on Giphy watch more than 2 million hours of GIFs per day. For most of us, cute kittens won’t fit our company’s brand or engage someone to deepen their relationship with our brand, but there are ways to tastefully use this. Business memes, like those with Ron Burgundy of Anchorman fame, can be used as well. The key with these is to offer something that is humorous but still represents your brand well. While these are a bit “old school” by today’s standards, webinars still have the power to get your expertise in front of potential clients by using audiovisual means in a live setting. Not only can you present your experience and case studies to a targeted crowd, but you can offer time at the end to field live questions with that audience. This allows for some dialogue and one-to-one engagement. An added benefit is that you can more easily sell your products or services at the end of the webinar or right after it is over via email marketing. While email might not be thought of as content marketing, it absolutely fits the definition. This can range from one-off emails sent or an automated email drip campaign or marketing automation or individual emails we write and manually send every single day. We are always selling ourselves, ideas, or products; some of us do it more effectively than others. And it doesn’t matter whether that is a formal or informal email. With this in mind, approaching all emails more thoughtfully than we have before can only increase our odds of being effective. Who hasn’t heard of or doesn’t actively use at least one social media channel? Do you use any of these? These platforms are a great way to get stellar content in front of potential audiences; just be careful not to solely broadcast self-promotional information about the company. Send updates on a variety of things (content, inspiration, testimonials, products/services), but always lead with and do more of content-related posts. People are on social media for an exchange of connection and valuable information … not just to be sold. Engaging people with brainteasers (quizzes) have been shown to keep our mind sharp; plus, they activate our curiosity. Contests taps into the part of our brain that is seeking to win something. When was the last time you completed a relevant quiz or gave your information in exchange for entering a contest online? I know both usually hook me. Content marketing has strong value to both business-to-business and business-to-consumer companies in generating leads that can be nurtured to a potential sale at some point in the future. B2B companies generally have a product or service with a higher price point, longer sales cycle, have more decision makers in the buying process, and have a longer contracted purchase life (subscription or monthly service) than B2C organizations. But both benefit from longer-term relationships, making each of them ripe for content marketing strategy. Let’s take some time to consider these nine B2C and B2B content marketing tips. A brand isn’t a logo, tagline, or color palette but rather a set of promises that you intend to deliver on to your customers and employees. This one might seem like a no brainer that your brand is already defined, but it may not be fully and clearly communicated to the marketplace. When we get engaged with a new client, we often find that there is quite a bit of disagreement internally on what a brand’s strengths are and how to message that into the world. We recommend you take some time to define your brand, personas to be targeted, and the tone/voice of messaging your company will take with internal or external communication before you start any content marketing. The danger in starting marketing first before any confusion is eliminated is that you risk wasted effort on messaging that misses the mark. Instead, by documenting these and getting agreement from key leadership, content marketing will be more effective since it can be held accountable for meeting those goals. And if those goals can’t be achieved with content marketing, that conversation can be had before any investment is made. Perhaps, a different marketing strategy is warranted to obtain those objectives or the goal may need to change. Don’t forget to fund your content marketing. “Free” is cheap but rarely is effective. Some could be relatively easily repurposed from one medium to another (blog post, video, e-book, etc.). Or you might need to update the content to include new or revised information. Or maybe you need to combine other content into one larger, more powerful piece. Determine the types of content that fit your audience best; then plan a month, quarter, or year’s worth of content. Work on where and how you are going to get these pieces of content in front of existing and potential customers. Review the content topics and targeted times of the year with a variety of departments to identify pain points or educational needs of potential customers. Lean on a combination of internal and/or contract writers who are first and foremost expert writers, not just those with industry experience. While this is counterintuitive, I recommend an A+ writer who has written for a variety of industries over a B+ writer that has written only in that specific industry vertical. The former, as an experienced writer, can learn any industry vertical in short order. Not only does this help you grow your SEO traffic, it identifies topics that have broad appeal and more people searching for answers to those questions. We recommend that if you are going to create written content for your website that you do proper keyword research using SEMRush or Ahrefs to identify topics with high search volume and that aren’t too competitive to rank for to increase the odds of success. It may seem that it should go without saying, but you don’t want to do all of the strategic planning and fall down in the execution phase. Sadly, many miss the mark here; in some cases, it would’ve been better to never have started than to plan and not finish the job. This often forgotten (usually an afterthought, if at all) aspect of content creation is crucial to leveraging the newly created asset to connect with people month after month and year after year. Planning how you are going to distribute your content to existing clients (email, social media, etc.) is just as important as potential ones (organic search engine, cold email outreach, paid social media, etc.). In order for a piece of content to have ongoing traffic, it must get a jumpstart boost. Without a robust distribution plan, even the best content will fall flat. Now that you’ve done the hard work of creating top notch content and promoting the stuffing out of it, don’t forget to formally track your efforts. Don’t just sporadically check your analytics reports; document that data in spreadsheets and documents to turn that data into insights and recommendations to improve content or your process in the future. Follow through on those key recommendations with new iterations of your process, topics, and overall strategy. If you’re reading this, we’ll take it as a safe bet you are serious about amping up your content marketing game. We’d even be willing to wager that you are looking to generate new qualified leads every month. If you’re still trying to understand it all and how to make it work for your organization, we get it. Executing this “content marketing thing” well is more complex than it’s ever been. At Imaginasium, we create content that consistently generates qualified leads — it’s what we’re built for. We’re all about taking the time to understand a business and ensuring that message never misses the mark with potential customers.